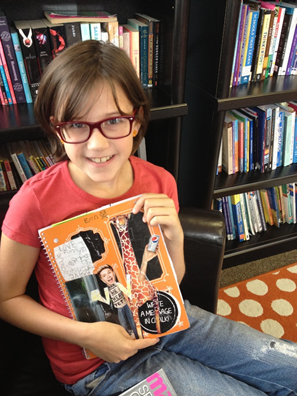 Sharing Our Notebooks: Welcome to THE WNY YOUNG WRITER'S STUDIO! Welcome to THE WNY YOUNG WRITER'S STUDIO! We are so grateful to Amy for inviting us to share our thinking about our notebooks on her blog today! We're all writers from the WNY Young Writer's Studio, and our notebooks help us gather our ideas, tinker with our drafts, hold on to important strategies, and reflect on what we do. It's exciting to meet other people who love notebooks as much as we do in this space. We hope you enjoy your peek into ours! Hi! I’m Erin. I love to use my notebook to brainstorm new ideas. I am inspired by nature, and I love to draw too. This is where most of my ideas come from. The picture below shows you the beginning of a poem I am starting to write. It isn’t in lines yet, because the ideas are just coming to me. 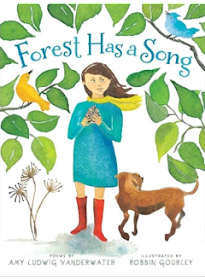 I thought of it by looking out the window at the trees while I was at the WNY Young Writer’s Studio. This is how many ideas come to me—by looking outside. Stop and look outside right now. What could you write about? I also love to draw, and this is how many of my stories begin. In the picture below, I am drawing my characters from my story. During a conference, I used the picture to begin describing the story out loud, and those who were listening said that it seemed like my character would be experiencing a problem soon. Drawing makes my characters and my story feel real. I use my drawings to talk about my characters with other people. Talking helps me come up with new ideas or details. Rather than writing your story, draw it. Then, talk about it with someone. Think about how drawing and then talking about your drawings makes your ideas better. Erin Day is a 10 year old artist and writer at the WNY Young Writer’s Studio. Last spring, she published her first short story. It was about a tragedy that befell a granny smith apple. She sketched the story first and then talked it through with several others before adding words. Hello. I am Peter, and this is my notebook. I use it to plan my stories. It has room for me to draw pictures. This is how I like to write because I am six, and sometimes, the words are hard to write for me. This slows down my writing. When I draw I can add lots of details fast and my story keeps moving. I like that. If you look at my picture, you can see how I used my notebook to plan the beginning, the middle, and the end of my story. I started by drawing the pictures, and I had an older writer write my words for me. My story has seven characters. Some of them are monsters. I began my story by thinking about what my characters were doing. I added all of the action to my story first. This is what I like most about stories myself. When I look at the pictures now, I notice details in the pictures that are not mentioned in the words. Now, I am going back and adding these details a little bit at a time. I’m using sticky notes to do this. My notebook is a place where I can draw and write fast and be messy. I am just starting to get ideas. I will make them better and better. I will write my other fixed-up copies on lined paper or on the computer. My notebook is for making a plan. Here is an idea for you to try: instead of using words to plan your story, try to use pictures. You can draw them or you can even use your camera to take them. Maybe you can find some in a magazine. See if the pictures help you add better details to your story plan. 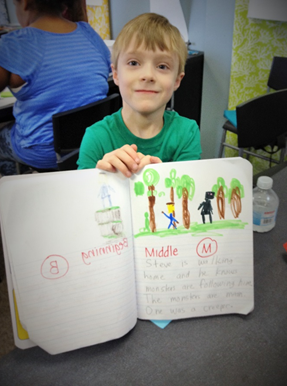 Peter Kane is six years old and a fellow of the WNY Young Writer’s Studio. His stories are inspired by his favorite games, including Minecraft. 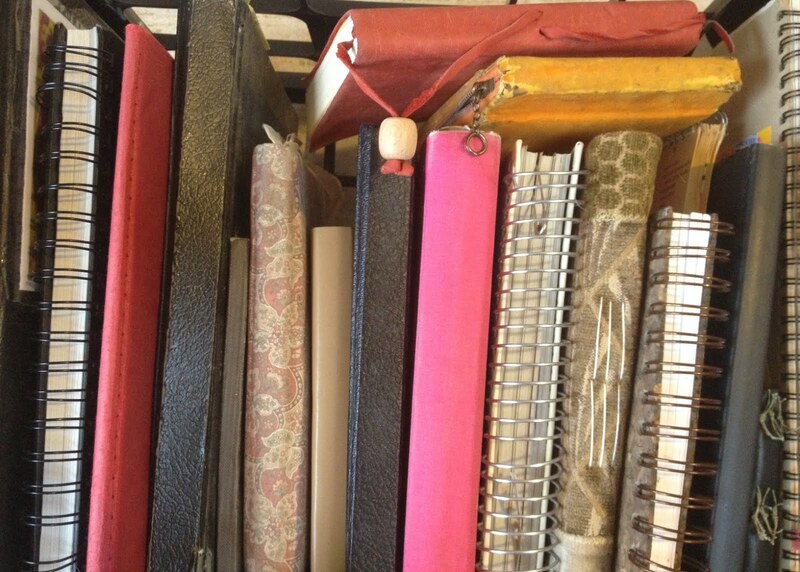 Our writer’s notebooks are where we keep all kinds of ideas for our writing. We use lists and maps and sticky notes to keep track of our ideas. 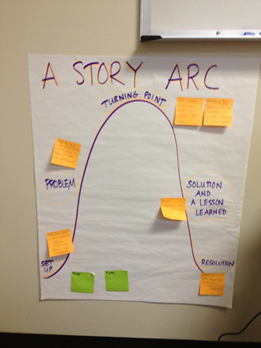 We also use make mini versions of the anchor charts at Studio and at those to our notebooks. Then, we can write and plan with them. We recently decided to add little pockets to some of our notebook pages, and they have been very helpful. 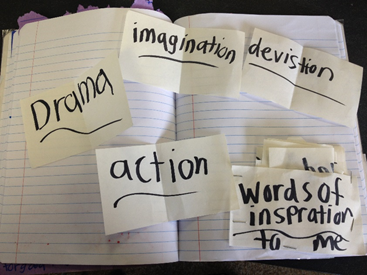 The pockets are filled with words that help us think about our stories better. When we pull them out, they make us wonder things about our stories. Where could we add more action? What are our characters feeling? Should we add more drama to our stories? Where? When it comes to our stories, we come up with new things that we should be thinking about all of the time. These get added to slips of paper and tucked into the pockets. We are learning to think about the problems we have as writers. We use our notebooks to try to solve these problems. 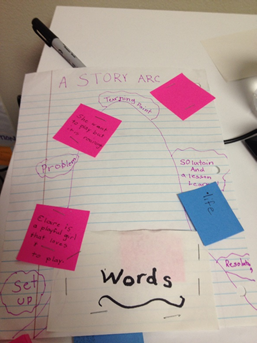 One problem we had was getting stuck for ideas while we were writing stories. Creating these pockets helps us. When we are stuck, we just pull out our words of inspiration, and they help us come up with better ideas. We also make lists of ideas too, like the colorful list in the picture. We made these tools all on our own. It kind of works like a game. Maybe you could try to do the same thing. Create a pocket for your writer’s notebook. Then, add all of the things that you could think about in order to make your writing better. When you get stuck, look at the words in your pocket. It helps! Julia Flynn and Sydney Mosher are both 8 years old, and they love to write together at the WNY Young Writer’s Studio. 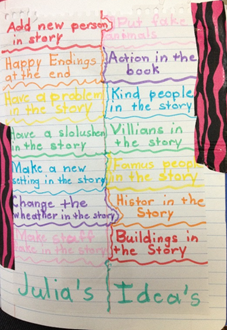 They also like to invent writing strategies like these. 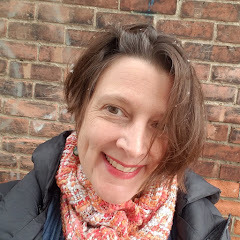 Located at 3062 Delaware Avenue in Kenmore, New York, The WNY Young Writer's Studio, founded by Angela Stockman, is a community where writers, teachers and young people come together to discover what good writing is, how to create it, and how to inspire others to do the same. We believe that all people are born writers and that the act of writing enables us to communicate our needs, raise our voices, connect and learn from others, and heal our lives as well as the world. At Studio, we learn how to honor and support the writer in everyone, because writers make the world a better place. 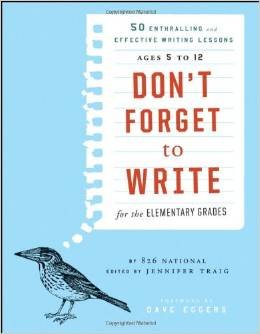 Angela has graciously offered a giveaway of DON'T FORGET TO WRITE, published by 826 National, and a new notebook to a commenter on this post. Please leave your words by Sunday, October 5, to be entered into the drawing. Thank you, young writers, and thank you, Angela! Angela, I love the work you are doing with both students and adults. These four students are beautiful examples of writers at work! 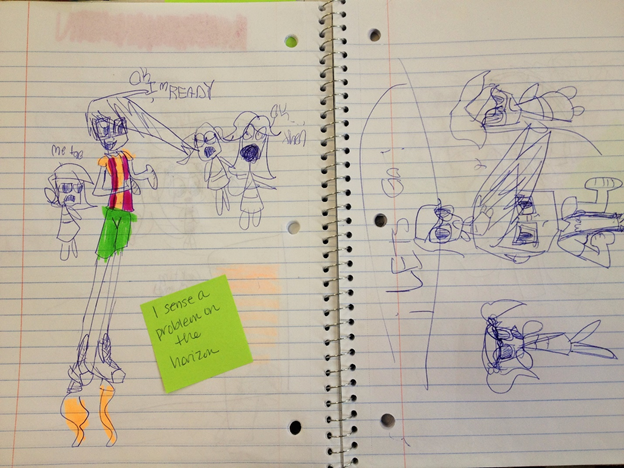 Julia, Sydney, Peter and Erin, thank you for sharing your notebooks! Thank you, Deborah, and many thanks to you, Amy, for your hospitality. Somehow, sharing what we do makes it that much more real. Thank you for giving us a wonderful audience. It's very powerful to hear the words of these young writers. I hope to share their words with the young writers that I work with each day so that they can learn from others who do the work they are being asked to do. Thanks so much for sharing such an inspirational post. Great notebooks, Erin, Peter, Julia and Sydney! I enjoy hearing about how you are capturing inspiration and turning it into word magic. Oh my goodness. I LOVE this post. I had a smile on my face the whole time I was reading it. These kids are already amazing writers. The future looks bright! It's so interesting to see the different ideas that these young and emerging writers have come up with. 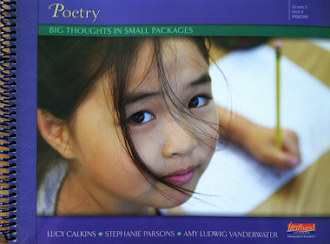 They have a lot to teach us about how one can be inspired by writing in various ways. I will definitely be trying these ideas in the near future! Congratulations to you all on your writing studio project. It's fantastic. I love the pocket idea for use when you're stuck. No writer's block this way! Just a quick but heartfelt thank you to all of you who took the time to read and support our writers this week. I can't wait to share your comments with them when we meet again. I hope your weekend has been as warm and sunny as mine has. Grateful for the warmth you added here as well. Have a wonderful week! I LOVED reading all of your posts! I can tell you have learned one of the most important lessons you can discover...writing is not a one size fits all activity! Erin, you have stumbled onto an exciting process. Observing this wonderful world and jotting down words and pictures which freeze what you're feeling and seeing is brilliant. Half the fun of writing is when you can go back and make perfect sense of those things. The delicious details will be the whipped cream and cherry on top! Not only are you a good writer, but I can see you're an artist, too. Well done, Erin. Peter, you're the man! It's very smart of you to realize that your brain is racing at the speed of light and your pencil can't keep up. That's the way it's supposed to be when you're six! I'm so happy to see that you have found a way to make it happen anyway. You're like a cartoonist-letting your drawings tell the story. They are like big rubber bands holding your ideas together until you or someone else can put them down in words. So you are really a writer AND an illustrator. Awesome, Peter! Julia and Sydney, the dynamic duo. First of all, it sounds as though you're having fun working together. The tools you've created to enhance your writing pieces are sophisticated and very clever. Every writer has times when he or she is stalled or needs a jump start; your notebook pockets are just the thing to get you moving when you're stuck. As your pockets grow, so will the quality of your writing. Those ideas will help add depth and order. It's exciting when that happens. Keep trying new things, Julia and Sydney! Angela, this is quite an impressive group. They are so fortunate to have someone to walk beside them as they grow as writers, instead of having someone pulling them along in one direction, at the same time. Keep up your efforts-this is amazing stuff! 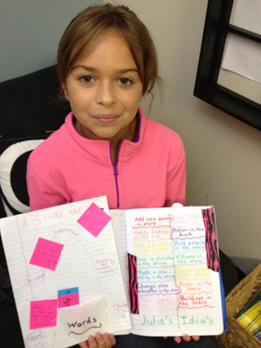 Thank you to Peter, Julia, Sydney and Erin for sharing your notebooks! 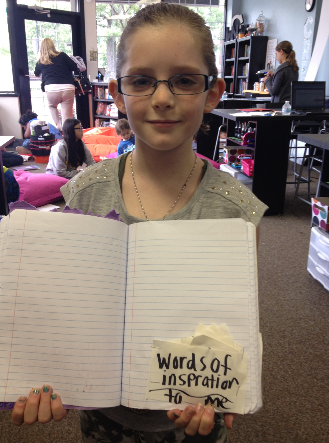 All of the students at Regan Intermediate School in Starpoint also have writer's notebooks. I have shared this blog with the teachers who can then share it with their students. They will be so excited to see other student's notebooks. Keep up the great work! !